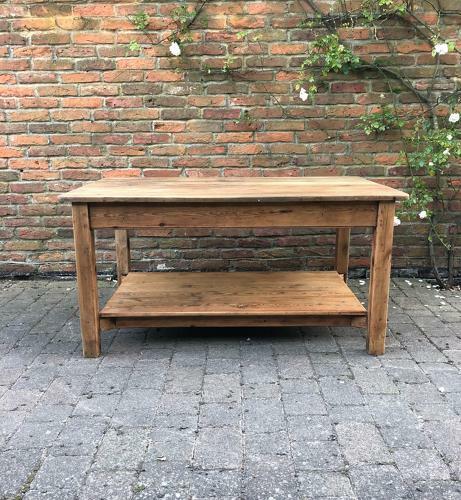 Genuine Early 20th Century Pine Bakers Table. Great piece (all original) with pot board shelf to the base. Works well as a centre island - could do with some large industrial castors in the legs just to raise it by a couple of inches...at the moment it is standard table height which is fine unless you are tall. You can see underneath how genuine it is...the top has had support boards added underneath just to keep it firm and solid and nothing else has been done. Surprisingly no worm. Great condition. Will have to be collected or sent by courier UK £45.